Khadi Anti-dandruff Hair Oil with fenugreek and mustard is dedicated for greasy hair, and scalp that is affected by dandruff. If you want to have a healthy scalp and beautiful hairdo, try out this product. You won’t regret! When to use Khadi Anti-dandruff Hair Oil? Khadi Hair Oil is not an ordinary hair care product. It is perfect for those who struggle with scalp problems and need instant repair. 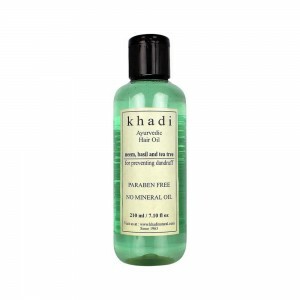 If you have noticed small white flakes on your hair, Khadi oil is going to help you. Moreover, if your hair is greasy and unmanageable, you must test this product as well. The cosmetic helps in both dry and oily dandruff. What are the properties of Khadi hair oil? Preventing the dandruff is its most important task. Fenugreek and mustard play the key role here. Khadi hair oil contains many other natural substances. For example, sesame oil and lemon moisturise the scalp and remove excessive sebum and dead skin cells. Tea tree oil and neem herb provide soothing and anti-inflammatory action. Camphor shows similar qualities (it soothes and cools the scalp). Mustard oil boosts hair growth. How to use Khadi hair oil? Shake the bottle before use so that the formula gets more fluid and flexible – now the application will be easier and quicker. Then, divide hair into small sections and apply Khadi oil between them. The whole scalp must be covered in the product. Do a short massage for better absorption. After an hour, wash your hair and let hair air-dry. If you leave-in the oil overnight, effects of the treatment will be even better.